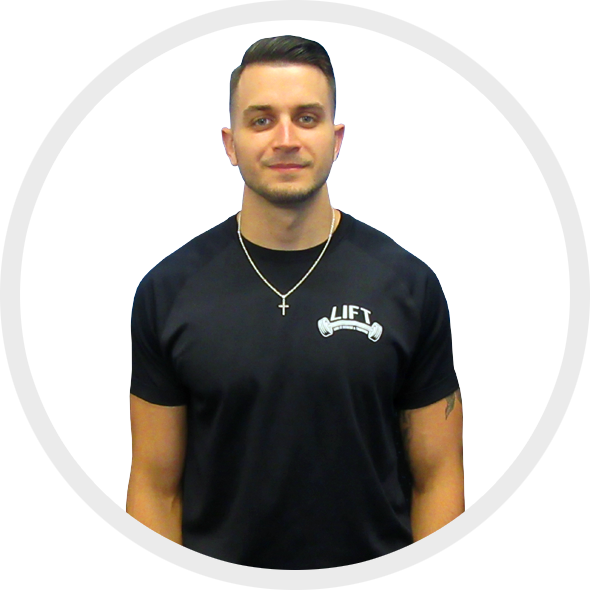 I am W.I.T.S certified personal trainer, which I received through Onondaga Community College after attending there for 2 years majoring in Exercise Science. My passion for fitness started in 10th grade. I became addicted to working out after seeing results in my body as well as seeing strength gains. I couldn’t get enough of it. Then soon after I got my cousin to start training with me and ever since then working and helping him reach his goals as well as reach my own made me realize personal training is the path I wanted to take. My passion is helping others reach their fitness goals. It’s the feeling I get after seeing the reaction of someone setting a new personal record on a lift or even the reaction they have after seeing results of losing pounds or inches off their body is why I love doing what I do. Watching others reach their goals that they work so hard for only makes me want to better myself as a trainer and weightlifter. Reaching your goals will not be easy or happen overnight, you must give it all you have and never give up. I’m someone that will get you motivated to become the best person you can be. Together we can accomplish any goal you have in mind!